The couple chemistry on Moonlighting became a primary focus of the print ad campaigns, not only in TV Guide, but in other national and industry trade magazines as well. Primarily, the ads called into play a comparison to classic screwball comedies and to classic screen couples. The ads did exactly what they were supposed to do -- define the genre, theme, and character dynamics -- and draw attention to the sexual chemistry of the lead characters. 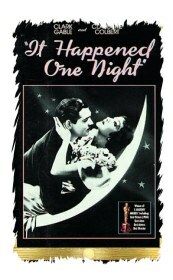 The earliest print campaign was from the photo shoot by Photographer Gary Bernstein for ABC, and I firmly believe it was patterned after the posters for the definitive early screwball romantic comedy "It Happened One Night." The large moon and stars backdrop and the couple in various poses around it reminds me so much of that film, that by association I just have to think "Gable and Colbert" and the playful, feisty banter. Another type of print ad were what I refer to as the "He Said/She Said" ads that were run during the last half of the second season and during the first part of the third season. These were snippets of banter that resonated with both the battle of the sexes and screwball comedy back and forth dialogue and double entendres that the show was known for. Most of these ran in TV Guide. As the relationship progressed during the course of the series, the ads became more intimate and the poses bore a resemblance to those of classic screen couples found on movie posters, with a touch of the zany, screwball sensibility thrown in from time to time. As could be expected, these coincided with the heating up of the romance and the inevitable sexual relationship of the duo. Oh, yes and a few of these involved promoting the love triangle storyline. One of these photo shoots that netted some of the most recognizable photos of the Moonlighting Duo was done by famed celebrity photographer Annie Leibovitz. Text © 2003-2004, Cindy Klauss. All rights reserved.